Two N-gauge layouts, St Alban's Priory and Grassington & Threshfield combined to win the MODRATEC Signalling Prize at the 2007 Brisbane Model Train Show. © The content of this article copyright 2007 Greg Goodchild. Send email for Greg Goodchild via MODRATEC. "Grassington and Threshfield" is my first major exhibition layout. It is a model of a station on a railway route that has a real historical justification for its existence. It incorporates a 20 track traverser designed to give actual distance and time between stations being able to capture and hold trains to simulate an actual journey. The Second station on this section of route will be "Leyburn". Grassington and Threshfield which opened in 1902 is located in the Yorkshire Dales and was the terminus of the 'Yorkshire Dales Railway'. Its twin name came from the fact that it ended midway between both villages in relatively open countryside. One of the YDR's proposals was to continue the line further up Wharfedale, tunnel into Bishopsdale and thence into Wensleydale where it would join the North Eastern Railway's line at Leyburn and run through to Newcastle without having to pass through the bottlenecks of York and Harrogate. My model is based on the completion of this proposal 100 years later. The track plan has been upgraded to allow 2 track mainline operation with the removal of the Buffer Stops and demolition of the Lollie Shop, (both the Lollie shop and one Buffer Stop are still in place as I write), and the straightening of Delaney's Sidings where they pass through the backscene. All trackwork is Peco with large radius Electrofrog points controlled by Wire-in-Tube. The period modelled is broadly 1938-1958 with a blend of Midland Railway, London Midland & Scottish Railway and British Railway stock seen at exhibitions. An occasional 'Lost' train may also be seen running through the dales to provide variety or generate entertainment with the punters, provided it is configured correctly and of British prototype. An 8F on a goods train enters the platforms at Grassington & Threshfield. Built by the YDR and taken over before opening by the MR the station had a 12'6" wide Prefabricated Timber signal cabin, located adjacent to Delaney's Sidings. The cabin had a frame containing 24 levers with 4 spares. I attempted to replicate this operation using "Gem" lever frames but could not get reliable operation with the equipment I had at my disposal. I was determined from the outset to fully detail the model as information came to hand and that included the installation of signalling. Currently I have non-operational signals and prefer to run through permanently clear signals rather than utilize working signals that may sometimes not function correctly and be at danger. The signals used are a mixture of Ratio, S N Mouldings, Langley and JJP. With the exception of the signal guarding the exit from Delaney's Sidings all are of the Lower Quadrant type. It was noted from period photographs that not all of these signal posts had MR finials. With track cleaning and photography sessions, keeping finials in place is a full time operation. Since I upgraded this single line country terminus to a two track Mainline working it was necessary to undertake some resignalling. I attempted to do this in a prototypical manner after trawling through numerous specialist books containing plans and photographs of similar station layouts. I can recommend the publications by the "Signalling Record Society" published by Midland Counties Publications as an excellent reference source. At the end of the platforms, the 8F is about to negotiate the level crossing. The current model was based on information available from books, videos and the Internet. In 2006 I stayed at the Station House B&B run by the family of the last stationmaster. I hold a reasonable amount of reference photographs of the station but was stunned by the number of unseen features not covered by these photographs but very important to the model. Thanks to the Stationmaster's son who has lived there most of his life I now have an extensive collection of photographs, detailed sketches, signalling diagrams and plans that will enable me to produce a more accurate model. At this rebuilding I intend to include operating semaphore signals to the mainline at least. I am not sure of the feasibility of producing working 2mm Ground signals but it is worth a go. Volunteers may contact me any time. My thanks extends to all those who have freely given advise and help based on their railway experience. © The content of this article copyright 2007 Kevin Knight. Send email for Kevin Knight via MODRATEC. 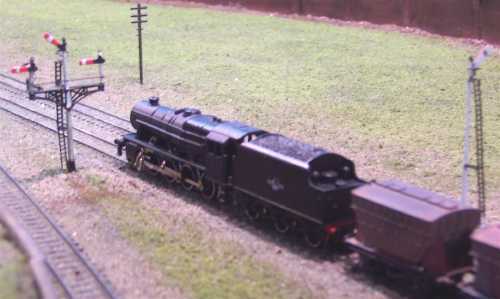 St Alban's Priory is a British themed N Gauge layout which has taken its inspiration from the track plan of St Alban's Abbey, a former junction terminus of the London North Western Railway (LNWR) and Great Northern Railway (GNR). Changes to the original track plan include duplicating the LNWR line and continuing it through the buffer stops and swinging the GNR branch to the right, crossing over the mainline from Watford Junction rather than heading away towards Hatfield. These changes have been made to allow for continuous running, as it was felt this was desirable in N gauge, where the ability to run prototypical length trains through significant scenery is a feature. The track on the scenic part of the layout is all Peco Code 55 with electrofrog points. The yard is fitted with electromagnetic uncouplers to allow for hands off shunting, using the Peco system. The period modelled is from 1948-1968, the British Railways steam era with the emphasis being on the late 1950's. From time to time, however, in accordance with Rule #1 (i.e. it's my layout, and I will run what I want!) trains from outside this period eventuate. After a considerable journey, the 8F acknowledges the home signals on the approach to St Alban's Priory. As noted previously by Graeme Lewis (winner of the MODRATEC Signaling prize at the Brisbane Model Railway Show for 2005 and 2006), "one of the fascinations of British Railways is its signaling". For me, the addition of signals helped to lift the layout from a toy train set to a model. In fact, I was very surprised at the change in feel to the layout when I started to install the signals. The challenge was to signal the layout using the prototype where possible and expanding on this theme where the changes had been made to accommodate the model. Initially the signals were Ratio kits of Great Western Railway (GWR) lower quadrants. These kits are designed to be made into working examples but, as they were not strictly speaking accurate (Rule #1 notwithstanding!) I didn't make the effort to do so. Towards the end of constructing the layout (it made its debut at the British Railway Modelers of Queensland Exhibition of Model Railways at Graceville in 2000) Ratio released their kit for a London Midland and Scottish Railway (LMS) upper quadrant signal. The first of these was fitted as the Up Outer Starter. Over the last year, more kits were obtained and all signals are now LMS upper quadrants, although the two triple brackets (one on the Down as the home for the Yard, Main and Bay platform, the other on the Up as the Starter for the bay platform on the GNR side of the station; Inner Starter for the main and clearance to the yard) are still on GWR posts as the LMS kit does not provide for bracket signals. As you can appreciate, building signals in N Gauge is challenging. Fortunately the Ratio kit, being plastic, can, with a bit of care, be assembled by the average modeller (certainly that is how I describe myself!). With a bit of patience they can be made into working examples, provided they are the GWR versions - the LMS one does not lend itself to operation by its design. A GWR push-pull train takes the sharp curve out of St Alban's Priory and across the double track line below. As yet, ground signals have not been completed for the yard, but it is hoped that this will be done by the Darling Downs Model Railway Club show at Toowoomba in June of 2007. Recently Tomix has released a range of working lower quadrant signals for modellers of the Japanese National Railways. As the JNR signalling practice is based on the British system, these signals do look very similar to GWR lower quadrants and as such, could be used to provide working semaphore signals in N gauge. At present there are no plans to do this to St Alban's, but the next layout, currently in the detailed planning stages, is almost certainly going to feature working signals - and most likely, having seen the MODRATEC system in action, a MODRATEC lever frame to operate these and the points they protect, to enable a more realistic model railway to be run. Again, like Graeme, I would urge modellers to include signals. If possible, make them operational and use them. It adds interest to the operational side of the layout, and also will add interest to those watching on. If nothing else, it will provide an icebreaker when the interested observer asks why a train isn't moving. Remember, they are a key part of railway infrastructure and cannot be ignored.